I am here at Drupalcon San Francisco. The weather has been great and it has been fun stopping by the Apple store to ogle all the Mac gear, especially the new Macbooks and of course the iPad. Anyway, back to the topic of Drupal 7. Dries gave his ‘State of Drupal’ keynote on Monday and he talked about where Drupal is heading and the difficulties being faced now and into the future. When Drupal was first created 10 years ago, Dries would have been happy if 10 sites ended up using his code. Today there isn’t an exact number, but it would be well upwards of 600,000+ sites that are powered by Drupal. Another measure of the staggering increase within Drupal is the number of people attending. 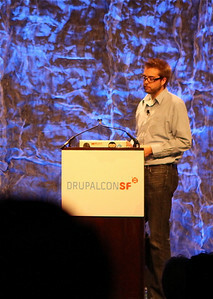 The first Drupalcon, held in 2005, had 40 developers. Right now there are nearly 3,000 people attending Drupalcon in San Francisco. This number would have been larger if hundreds of Europeans would not have been grounded by the mighty Eyjafjallajokull volcano. Drupal 8 will switch to Git for internal development. To date, Drupal has used CVS. Drupal currently has 19 different Distributions available. A distribution is customised package of Drupal along with modules to create a drop-in solution. Dries believes that distributions really set Drupal apart from other projects and will, if done well, open up Drupal to a much wider audience. Two years ago in Boston, Dries brought up the Semantic Web and Linked Data as being an important technology to incorporate into Drupal core. He wants Drupal to transition from not just linking to pages to pages, but linking data together into a Giant Global Graph (GGG) — coined by Tim Berners-Lee. 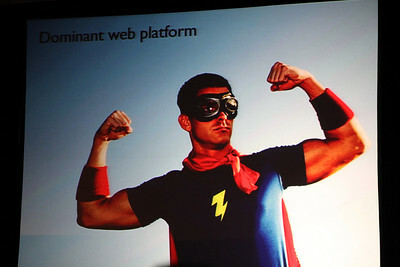 This will lead to better search, mash-ups, data importing/exporting; essentially turning the Web into a giant database. Drupal 7 will launch with RDFa built in. RDFa is a way of embedding intelligence within the HTML of the page. RDFa is similar in aim to Microformats, but is more extensible and also provides a rich framework for making each and every Drupal 7 site into a Linked Data client. Google supports and indexes RDFa and Drupal’s support of it is truly revolutionary and unprecedented in the Open Source community. Drupal is being used by big corporations. And these corporations don’t use “cool” technology. Actually, they really don’t like new or untried things. They will only truly embrace tech that has a proven track record along with a strong community and active development. This is a good sign of a strong Drupal ecosystem. Acquia Drupal is easily installable with the Microsoft Web Platform Installer. Basically click/download/install and you get a fully functioning Drupal install on a Windows machine. Pretty cool. Microsoft also just launched their MS SQL Server driver for PHP with PDO. If you would like to play with the bleeding edge you can install the whole package yourself. This includes IIS with FastCGI, SQL Server 2008 Express Edition, PHP 5.3.2, Drupal 7 and the required drivers and modules. This is something I would have never thought I would have seen — and not only that, but the above info was pulled directly off of a Microsoft web site! Drupal 7 has a completely re-written back end. It includes a brand new Fields API which means an end to writing SQL in code. Everything has been abstracted out and interacts with the PHP PDO layer in an object oriented way. This opens the doors for Drupal to be used with a much bigger pool of databases and other data storage technologies. This covers the usual suspects of MySQL and PostgreSQL to the newly announced Microsoft SQL Server 2008 and some experimental support for Oracle. Drupal 7 is NoSQL capable as well: CouchDB, mongoDB and Cassandra. NoSQL support was important in the Examiner.com moving to Drupal 7. In comparision, Drupal 6 supports only MySQL and, to a somewhat lesser extent, PostgreSQL. Drupal powers over 1% of the Web. Drupal 7 has more than doubled in code size. This makes it vastly more powerful than 6, but also means it runs slower. But Dries was quick to point out that it is much more scalable. Best case is June 2, 2010. Worst case is end of September, 2010. To succeed in the enterprise Drupal needs to focus on configuration managment and staging. To succeed in the low-end, Drupal needs to focus on better user experience. Both strands require increased usability, performance and framework improvements. To get there, Dries challenged the attendees to give back. Drupal has a culture of sharing and contributing back — to continue to succeed means to continue to share.